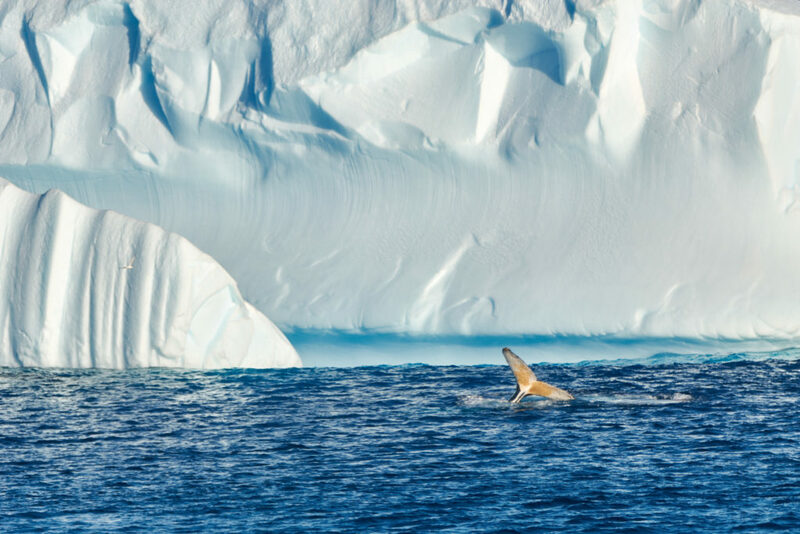 A whale frolics in Antarctic waters while feeding on krill near an iceberg. Image Diego Cotterle. 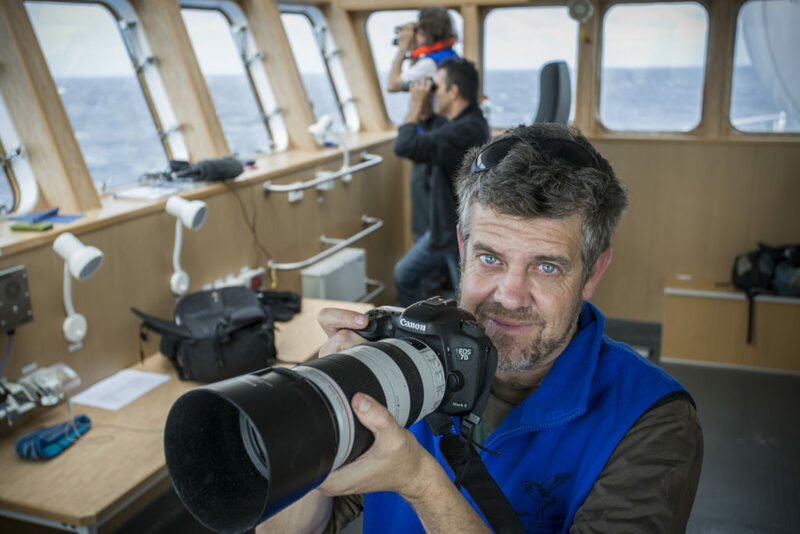 Dr Eric Woehler, from BirdLife Tasmania and University of Tasmania, joined Investigator’s most recent voyage to the Southern Ocean to gather data about the distribution and abundance of sea birds. 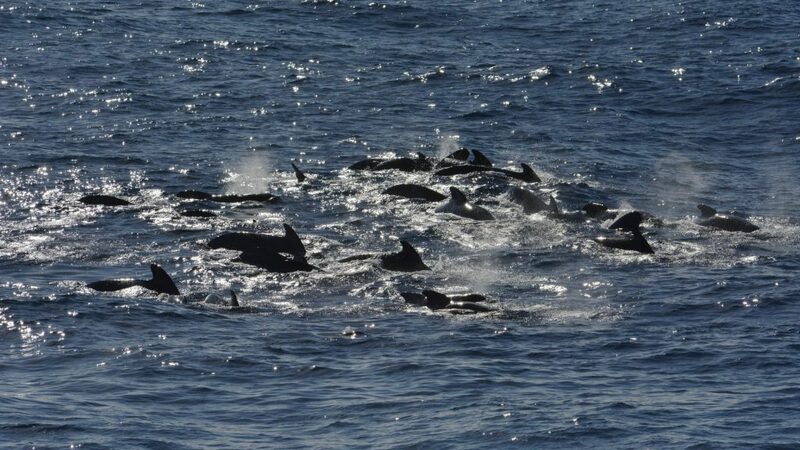 While at sea, Eric made another interesting sighting when a sizeable pod of long-finned pilot whales was spotted. “We saw the pod a number of times, with the whales approaching the vessel rapidly on the first two occasions and remaining within 100 metres for several minutes before heading off,” said Eric. Long-finned pilot whales are a wide-spread species in the Southern Ocean but such large pods are not frequently seen. 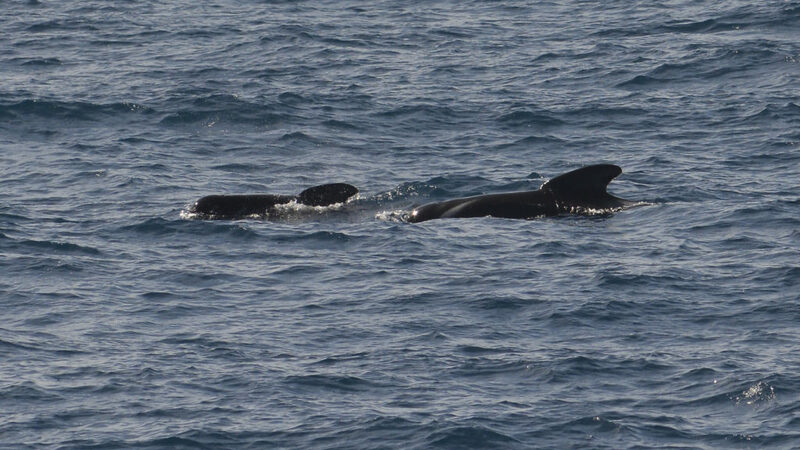 A pod of long-finned pilot whales seen from Investigator during a recent voyage to the Southern Ocean. Image Eric Woehler. Both adults and calves were spotted in the pod estimated at over 150 animals. Image Eric Woehler. The nearness of the whales and the length of their visit ensured good estimates of their numbers and of the calves present. 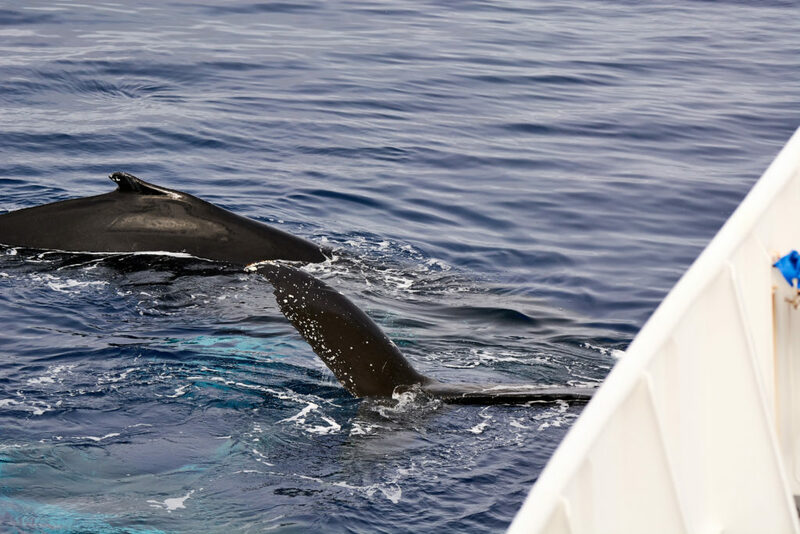 It was a similar ‘whale-tale’ for those on Investigator’s voyage into Antarctic waters in early 2017, with a bounty of close-up marine life sightings that included repeated ship-side visits by some inquisitive humpback whales. A range of other animal observations, gathered both from targeted research and opportunistically during the voyage, have also provided valuable data for increasing our understanding of life in this harsh and remote marine environment. Inquisitive humpback whales in Antarctica take a closer look at our research vessel Investigator. Image Diego Cotterle. 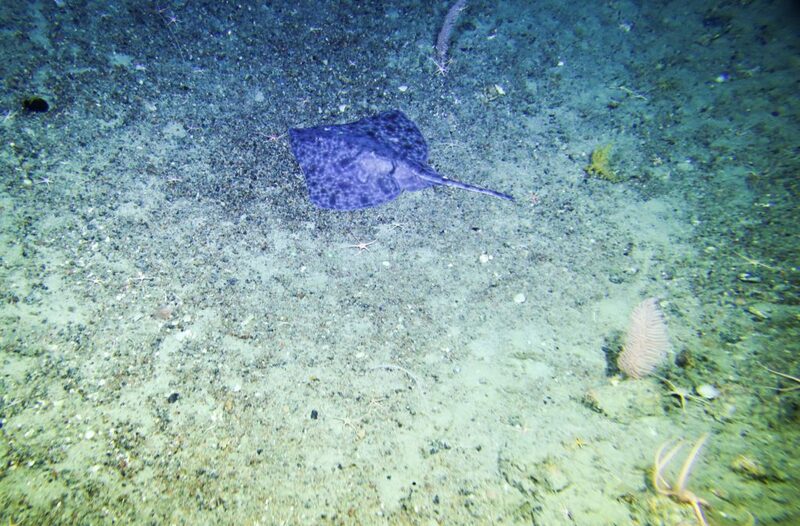 Deep camera tow surveys uncover an amazing a-ray of life on the Antarctic sea floor, including dozens of brittle stars and other starfish cousins. Smile and wave, boys! 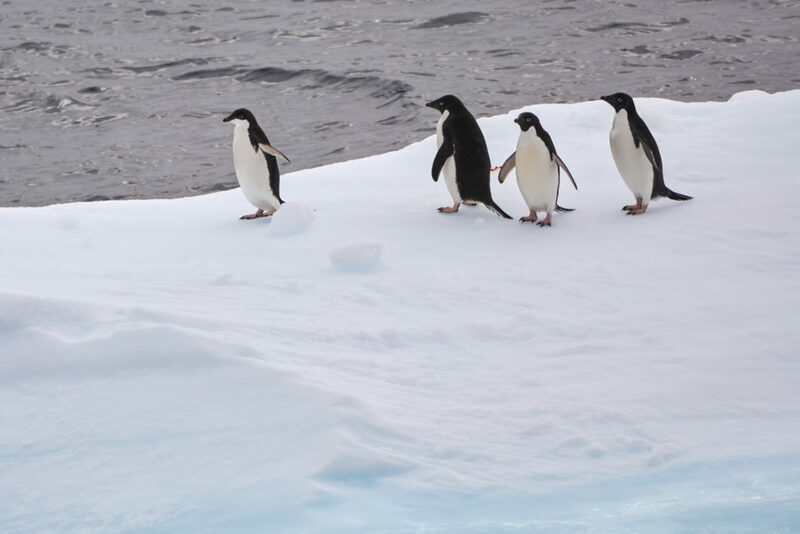 Adélie penguins seen hitching a ride on an iceberg in Antarctica. Image Diego Cotterle. Another sighting made on Investigator’s recent voyage revealed a remarkable story of life in the Southern Ocean. 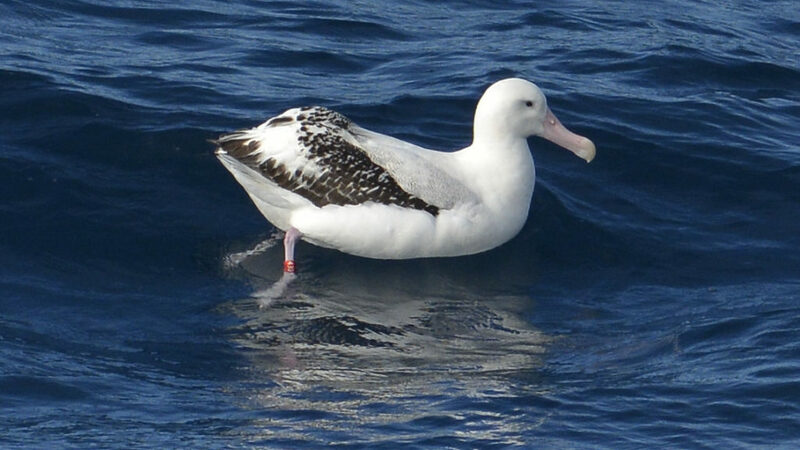 A Gibson’s albatross, a sub-species of wandering albatross that breeds on the Auckland Islands south of New Zealand, was observed near the ship and seen to have a colour band on its leg. The bird stayed with Investigator for the best part of two days, teasing those on board by never approaching too closely but not being out of sight for too long. With a bit of luck and patience, Dr Eric Woehler and his team were able to snap a photo of the colour band and identify the bird. What follows is the remarkable story of Gibson’s albatross ‘43G’. Our well-travelled Gibson’s albatross ‘43G’ sitting close to Investigator. Image Eric Woehler. 43G was banded by a New Zealand research team on Adams Island, one of the Auckland Islands, as a breeding adult back in 1991. Eric and his team contacted the New Zealand researchers, who were pleased to hear that 43G had been spotted alive and well. They told Eric the bird was at least 10-20 years old when it was banded, meaning it was now at least 36 years old but more likely 46 years or more! A good innings for an albatross and we guess it just goes to show, if you have a band you will go places! Unlike 43G, much of the life in our oceans is not so easily found floating on the surface and researchers have to carry out targeted surveys to find out what lies beneath the waves. They can do this using sonar, deep water cameras or by collecting specimens using equipment such as nets, dredges and corers. And sometimes animals appear when least expected! On the recent voyage, researchers calibrating a new multi-beam acoustics platform used to investigate deep water life were surprised by a squid attack! These random encounters with life in our oceans provide valuable observations about not only animal distribution and abundance, but also about their behaviour. Blerg! A face not even a mother could love! 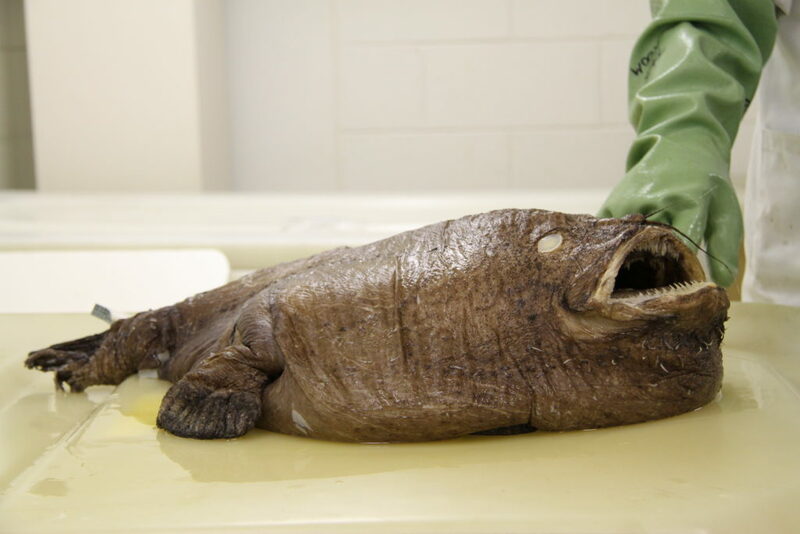 A monkfish in the Australian National Fish Collection. Where deep sea animals are collected on a voyage, some will be retained and end up in museums, universities and collections across Australia. When it comes to fish specimens, many of these are curated in the Australian National Fish Collection (ANFC) in Hobart. This collection of Australia’s marine biodiversity is a vital resource that supports research to improve our understanding of our marine fish and fisheries. Fish in this collection become famous! Scientists from around the world visit the collection and borrow material for examination, and to make comparisons with fish from other regions. The ANFC currently holds more than 150 000 fish specimens, representing some 3 400 species. Recording animal observations during voyages is important for increasing our understanding of the marine environment, particularly as Investigator often boldly takes researchers to remote regions of our oceans where few researchers have gone before. At the end of the day, all observations and specimens are collected for one primary purpose – to provide useful data for research and policy making. One of the foundation principles of the Marine National Facility, which owns and operates Investigator, is that all data must be open access and made freely available to all within 12 months of a research or transit voyage. Resources like the Atlas of Living Australia (ALA), a facility hosted by us, are vital for making these data accessible to all. The ALA is Australia’s national biodiversity database and contains more than 67 million records based on specimens, field observations and surveys. It combines biodiversity data from multiple sources, and makes it freely available and usable online. In short, the ALA is made up of records contributed by Australia’s academic, scientific, and environmental communities, as well as by you! Researchers on Investigator’s level seven observation lounge keep watch for life on the high seas. Image Ann Jones/ABC. While technology provides a force multiplier for research, the trusty old human eye still has an important role to play in making observations about life in the world around us. Every voyage of Investigator offers the opportunity for all on board to make and record sightings, and contribute to increasing knowledge about the amazing life found in our vast oceans. Find out more about contributing to Australia’s national biodiversity database – the Atlas of Living Australia. Good to see this inspiring investigations of nature continue. If we know what is there then we have a greater chance of surviving when the unknown comes to us, whether facilitated by our ignorance, short-sightedness or simply greed that drive much of the policymaking in the present. It reads like it was a great voyage – what a buzz it must be to participate in these scientific endeavours! So many diverse activities, always interesting company. I think this is the greatest gift to humainity there could possibly be. I have sailed all my life and am well aware of the diversity of the oceans, even close to the continental shelf. Research voyages like this, especially in places like the southern ocean arpund the convergence zone is invaluable. If I had a choice, ALOT kess of my tax dollars would go to politicians’ mansions, and go towards research like this. Thank you so much for your ongoing desire and the need for knowledge in an invironment where outdated resource based mentality continues to dominate a world whoch has moved on.